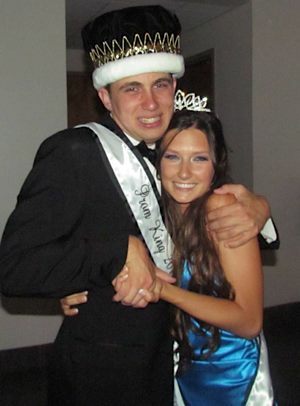 Scott Shaver and Katie Buell were crowned prom king and queen last week at Westview High School. Sound typical? Yes, but Westview is not your typical high school. Sure, Katie is an all-American girl, class president, champion in girls basketball, and “an absolute sweetheart,” according to her teachers. Yet, it seems every student, no matter their ability, is accepted here and treasured. “Scotty”, as the kids call him, is a HUGE personality at the school, brought out of his shell over four years by the nurturing attention given, not only by specialized staff who have tutored him as a special needs student with autism, but by the accepting student body. When he first came to the San Diego area school, he was petrified of the chaotic sounds of 2300 kids in an assembly. Now, he attends all the sporting events cheering loudly in the bleachers. When the football team scores a touchdown, he gets the giant “W” flag and runs up and down the sidelines. When he first came to the school, his mother said, he could never have believed he would be dancing in front of the entire school to the pulsing beat of “We Are Family”. 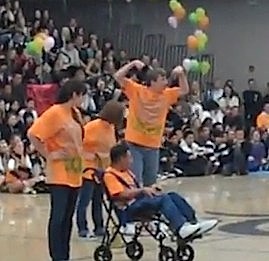 But after just one year, his success at school — mainly, said his mother, Marlene, due to all the “regular ed” kids practicing inclusion — Scotty was able to join the Westview dance group in their twice-yearly choreographed “Friendship Dance”, which includes the special needs kids each paired with a team regular. For three years now, he has been taking a bow at every performance while flexing his muscles in the air with wild enthusiasm. (See the video below). Marlene also credit the “Best Buddies” program that matches a special needs kid with a regularly-enrolled student to be partners in friendship throughout the school year. It’s one of the most popular clubs on at Westview. No one knew the outcome last Saturday, when students assembled in their rented tuxedos and hand-picked dresses. Scott’s mom and older brother Kyle, a graduate of Westview, were there, too. Scotty’s “Best Buddie” was delighted to be his date for the evening. At 10 o’clock, the faculty announced the prom court winners, saving the king for last. This is not normal high school stuff. With the release of the documentary, Bully, people are all too aware of the dark side for many teens. Westview should have been making their own documentary. As one educator said, “There’s a reason why everybody tries to get hired in the Poway School District, this is one of them. Scott’s “HUGE” personality “is over the top”, says his mom, because everyone at Westview accepted him and loved him. The teachers and administrators at the school will very much miss Scott when he says goodbye in 2 weeks. He cheerfully helped out in the office over the years and “people couldn’t help but love him”.